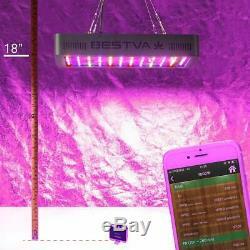 BESTVA 1000W LED Grow Light Full Spectrum Dual-Chip Growing Lamp for Hydroponic Indoor Plants Veg and Flower. 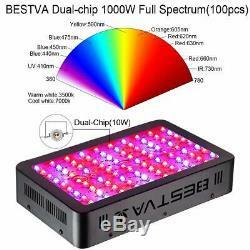 BESTVA Newest Technology: Dual-chip(10W) LEDs which is much brighter and more efficient than traditional 3W and 5W LEDs. It is the HIGHEST PAR/LUMEN OUTPUT PER LED. 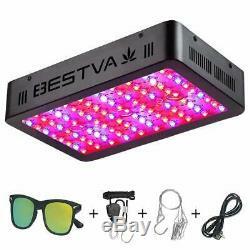 Full Spectrum 1000 watt led grow lights are beneficial to plants, vegetables and flower indoor growing at all stages, just like in the natural sunshine. Powerful Cooling Fan System, cool and quiet. 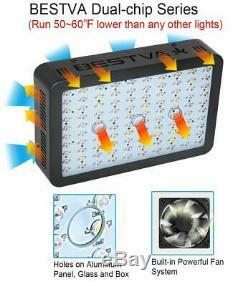 Holes on the aluminum panel and the glass make heat convection, run 5060 lower than any other lights. 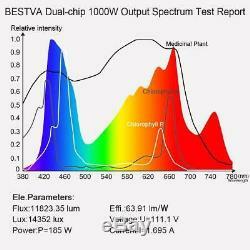 Compares to 600 watt HPS while consuming only 185 watts! Twice effective coverage area than any Reflector Series lights, perfect for a 5.1' x 4.7' growing area at 24 height. Dimension: 12.2x8.26x2.36 inches. 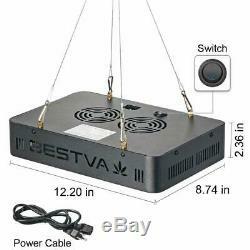 Replaces a 600 watt HPS/MH. Item Weight: 7.0 pounds. 100pcs Dual-Chip 10W Bridgelux/Epileds LEDs. Indoor use only, not waterproof. Extremely bright, do not look directly. No extra ballast is needed. Can be controlled by Timer. This light has a full spectrum design, producing 380-780nm visible light, replacing natural light. 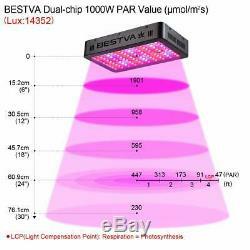 The item "Grow Light LED Full Spectrum Dual Chip Growing Lamp 1000W Hydroponic Plants" is in sale since Wednesday, April 3, 2019. This item is in the category "Home & Garden\Yard, Garden & Outdoor Living\Gardening Supplies\Hydroponics & Seed Starting\Grow Light Kits". The seller is "jhj_homegoods_inc" and is located in United States. This item can be shipped to United States.